How to Make Beef Tenderloin Steak Black Pepper Cream Sauce .The foodies? You've got to try the food on this one? Special food this time we will present you the lovers specially processed based on beef. Had tried Steak beef tenderloin? Yes very true this steak beef meat tanderloin is taken from the waist cows near the kidney. The meat has a lot of fat and muscle, so when in grilled meat will be noticeably softer and tastier compared with other meat steak. 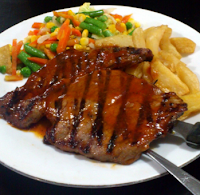 Usually these foods adanyaa only in certain places, such as five-star restaurant, but if you want to make it at home, please try it, you know who feels no less delicious with steak in the outcome there. Follow the following way easily yaa . 0 Komentar Untuk "How to Make Beef Tenderloin Steak Black Pepper Cream Sauce"